Hyundai isn’t the first name that comes to mind when one thinks of an executive sedan. The Europeans surely have an upper-hand at this game. When one thinks of spending in excess of 15 lakhs for a vehicle, the Toyotas, Volkswagens and Skodas come across as a natural option. The Hyundai is an extremely compelling package for the price. And it isn’t worth the snub that it usually gets from it’s potential customers. 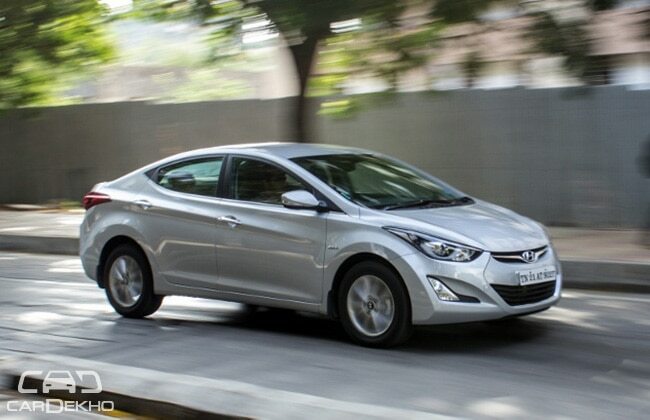 Hyundai has recently given the Elantra a minor facelift, we take it for a spin to find out how it does. If Hyundai ever needed an outright demonstration of their ‘Fluidic’ design philosophy, I reckon they’d pick the Elantra. Every other Hyundai on sale in the Indian market seems rather subtle in comparison. The Elantra gets a bucketload of swooping lines, bulges and flared wheel arches - which I beleive hide the size of the car extremely well. The face remains identical to the outgoing model - retaining the same sloping bonnet and large pulled back headlamps. The headlamps themselves now feature a projector set-up. They sport neatly executed daytime running lights too, which have become the norm in this segment. The facelifted Hyundai features new fog-lamps, which sit snugly inside an L shaped housing. There are subtle chrome highlights on the grille and the airdam which give the car a well balanced look. The side remains identical, with the only update being the new 16” alloy wheels shod on 205/60 R16 tyres. The side profile shows-off the fluidic theme brilliantly, with a bold character line running across the length of the car - starting from the front door and disappearing into the wrap-around tail-lamp. The sloping roofline gives it a coupe-ish look. There’s a slim chrome trim running along the window-line, which is a neat touch. The rear gets an all-new bumper which has a black lower-portion that mimics a diffuser. The tail-lamps get an update too - it is a shade darker than the older model and now mimics an LED setup. To sum it up, the refresh does add some zing to the overall offering. Although not as understated as a Jetta or as clean as an Altis, the design on the Elantra is definitely well-executed. Although, we do wish it came equipped with a Sunroof. A glaring omission, especially considering the price point. The Elantra did make people glance multiple times, especially after sunset when the drls make the car look menacing. The Fluidic theme is carried over to the interiors too. The entire interior fascia looks like a single unit. The top half of the dash flows into the central console, which inturn flows into the gear lever housing seamlessly. The interiors on the Elantra would be at home on a vehicle even a segment above. Not that anyone expected Hyundai to skimp out on quality, but the fit and finish is absolutely top-notch. The materials used feel high-grade and definitely not built to a cost. The version we drove featured the all-new, all-black interior theme. A bold move by Hyundai, considering how much our market loves beige! The all-black theme makes the cabin look extremely premium. There are dull silver highlights here and there; e.g: around the ac vents, door pads etc. which help make it feel slightly lively. The steering wheel is wrapped, oddly if I may add, in dark brown leather. That sticks out like a sore thumb. It does feel nice to hold though, and is extremely light. The steering houses controls for the audio system, bluetooth telephony and the cruise control. A bit too many, if you ask me. If you have large palms (like I do), you’d find them hitting the cruise control or the seek buttons when you try to reach for the horn. The instrument cluster houses twin pods with thin silver outlines. It also houses an MID, and digital fuel and temperature guages. The start stop button sits right below the instrument cluster, near the ac vent. The central console houses the 4.3 inch touchscreen infotainment system that doubles up as a screen for the reverse camera. The screen is smaller than preferred. Although the touchscreen unit works flawlessly, I preferred using the buttons to operate the system. The party-piece however, are the two buttons that sit beneath the ones for the dual zone climate control. The buttons for the ventilated seats! If there was any feature I wish was made standard on the little hatchbacks of today, it’d be this. The ventilated seats come as a boon in our sweltering climate. The bliss of not having a sweaty back at the end of a long drive is unparalleled. Thumbs up to Hyundai for this. Storage spaces are aplenty in the vehicle. There are more than enough cubby-holes for the bottles and the files or similar knick-knacks. The seats on the Elantra are an extremely comfortable place to be in. Be it the front, or the rear. The driver’s seat features 10-way electrical adjustments, while the passenger has to make do with manual adjustments. A memory function on the driver's seat would’ve been a big plus for the car. The electric seats along with the steering wheel (that can be adjusted for reach and rake) make it rather easy for the driver to find a comfortable driving position. There is a central armrest too which is slightly lower than I’d have liked it. The armrest itself has a storage bin which happily swallowed a couple of sunglasses with their cases. The rear seats are decently spacious and can house three adults. There is a slight hump on the floor at the rear, but it doesn’t eat up too much of space. The rear seats get an arm-rest which houses a 12V charging socket. Neat touch. The controls for the audio system which were present on the rear armrest earlier, have been deleted! The seat compound is nice and soft, which make the ride extremely comfortable. The knee-room and head-room is adequate - I could sit comfortably at the rear with the driver's seat adjusted to my position (I’m almost 6ft tall). That said, the head-room might be an issue if you are over 6 feet tall. Overall, the interiors are a good place to be in. The fit and finish is brilliant and despite the all-black theme, it manages to look and feel spacious. Unlike the Jetta or the Octavia, the Elantra can genuinely seat 3 adults at the rear. Bootspace is a healthy 485 litres. It will swallow the luggage for the extended weekend or the Golf Club Bags with equal ease. Let me begin this section by saying that I underestimated the engine and it’s capabilities. The Elantra comes with two engine options, a 1.8 litre petrol engine producing 149.5 PS of power and 177.5 Nm of torque and a 1.6 litre diesel that churns out 128 PS of power and 260Nm of torque. Both engines can be had with either a 6 speed stick-shift or a 6 speed automatic. We drove the diesel automatic variant. On paper, it might seem that the 1.6 litre engine might be less for a car that is as big as the Elantra. The competition is a mixed bag too, with the Renault Fluence featuring a 1.5 litre engine and the Octavia sporting a 2 litre diesel engine. The 1.6 is completely adequate for the car. At crawling speeds, one will find the car hunting relentlessly for the right gear - which can get slightly irritating. The automatic transmission isn’t too sure about upshifting especially in slow moving traffic - it waits for you to dial in a bit more of throttle before it actually shifts. Unless you plan to drive it like you stole it, the Elantra wouldn’t feel out of breath anytime quickly. The diesel mill is much better off cruising at 100kmph at a lazy 1900rpm in sixth gear. The acceleration is linear - you don’t get pushed into the rear seat under hard acceleration as you would in a Jetta. When you do floor the throttle however, the automatic transmission doesn’t hesitate to shift down a gear or even two. There is a slight hint of delay in shifts, but that can be easily excused. It is key to note that the Elantra doesn’t feature a ‘Sport’ mode. The engine’s responsiveness is directly proportional to how heavy your right foot is. We really feel the Elantra could’ve done with Sports mode and paddle shifters - since the Jetta has them. The Elantra features an all-disc setup. The braking is as expected from the sedan. Though, we’d have preferred if the braking was as linear as the acceleration. The pedal response is slightly vague. If you press the brake pedal slightly more than 50%, it bites in a bit too sharply. Right upto that point however, it does feel slightly numb. The suspension is rather soft and is tuned for comfort rather than attacking twisties. It soaks up the bumps and potholes without breaking a sweat. However, while tackling broken roads - it does tend to make the occupants bounce around a bit. The steering is extremely light and weighs up very slightly as the speed increases. Maneuvering the car around the city is extremely easy. It feels one size smaller than it actually is. The suspension and steering feel have been plaguing Hyundais for over a decade now. None of the Hyundais feel confidence inspiring at high speeds, and the Elantra is no different. The steering becomes a tad-bit too light and suspension wise, lets just say the European cars have way better highway manners comparatively. Although the Hyundai can reach high speeds rather effortlessly, we’d recommend you not to be a bit too adventurous with it. Like mentioned earlier, it is at ease cruising between 100-130kmph on the highways. At these speeds, neither does the steering feel nor does the slightly bouncy suspension bother you. It is a relaxed cruiser. It really is. The Elantra is a giant in a gentleman’s suit. Nothing else. It doesn’t have any unruly manners and just gets the job done. It isn’t meant to clock 0-100 times nor do breakneck speeds on the motorways. When you understand the limits of the car and stay within it, you realize the Hyundai is a delight to drive and be driven around in - a combination very few cars manage to pull off. Inspite of its size - it is manageable in the city; it is one of the most comfortable cars in its segment; it is a proper 5 seater and comes loaded to the gill with equipment. The Elantra manages to be an inoffensive car on all fronts.